Here's the family of the woman who got bonked on the head. With an explosion of sound and fury, the baseball crashed into the seat directly in front of me, ricocheted back out in the direction from which it came, and smacked the lady sitting in front of me directly on the side of her head. Wincing in pain, she brought her fingers up to touch her ear lobe, and I could tell that the back of her earring had been jammed into the tender skin behind her ear. Poor mama was in a lot of pain, and her husband and two little boys ignored the loose ball rolling around at their feet and tried to comfort her. This, one might presume, is all a part of major league baseball. If you're going to sit out in center field, best be prepared for the home run ball. But we were between innings when this mishap occurred. No one was at bat. So what happened? And here's the center fielder who lobbed a grenade into the stands. He felt bad too. Suddenly, a man came rushing down the stairs from his seat behind us to catch the loose ball. As he triumphantly scooped it up, he looked at the woman in pain and realized she had been hit. Then I noticed the center fielder, who had just completed his between-innings catch-and-throw session with his fellow outfielders, was staring up at our little corner of the stands. And I put the pieces together. The man behind us had been hollering in a good-natured way to the center fielder, asking him to toss up a practice ball. The center fielder, who currently plays for the opposing team, used to be a hometown Mariner and was apparently feeling playful and happy to appease an old fan. So as the inning break was coming to an end, the center fielder fired the ball up to the man behind us. But his super-powered throw fell short of his target, and that's how the ball came to crash into the seats in front of us. At that instant, the woman was busy with important between-inning duties, negotiating how an order of cheese nachos was to be shared between her two boys, so she was not alert to the incoming baseball. And by the way, she was increasingly not happy with this baseball to the noggin situation. She was, in a word, fuming. As he gleefully scooped up the ball, the man from behind us quickly put all this together. His face shifted rapidly from celebration to chastened, and with a quick, gentle gesture, he put one hand on the woman's older son's shoulder and handed him the treasured baseball. He quietly apologized to the woman and her man, then beat a hasty retreat back up the stairs to his seat. But he wasn't done yet. At the end of the next inning, our neighbor came back down the stairs and approached the family once again. This time, he repeated his apology in a clear, sincere voice, asking if there was anything he could do to help the woman. Still angry and tight-lipped, she said no. He respectfully said goodbye and disappeared behind us, this time for good. "I'm going to be at least an hour late tonight," my husband intoned. Still sitting at his desk in the office, he explained, "One of my staff had a really bad day today. Just as I was trying to leave, she came in and wanted to unload some of her frustrations. So I needed to stay and listen." Hmm. Interesting. My husband has many fine qualities and I imagine him to be a fair and respectful boss. But listening to female subordinates vent their troubles does not strike me as an area of natural giftedness for him. I was, in a word, intrigued. "That's fine," I led. "So how did that go?" "Oh, fine," he responded airily, "I showed her my card." "Your card? I don't know what you're talking about." After dinner, when the dishes were cleared away and we were just about to sit down and watch another record-breaking round of Jeopardy, he made a quick lap to the far end of the house where he keeps his backpack, and then came back into the room. "Here's that card I was telling you about." I find it so interesting that whoever gave this card to my husband chose to not sign it. But he seems to appreciate it just as it is. "Oh, someone gave it to me once when I was dealing with a real mess. So I kept it and I show it to other people from time to time." "Did it help your person today?" "I think so. She smiled when I showed her." Within twenty-four hours, these two stories collided in my head and brought forth a single, simple thought: compassion comes in many colors, and while we might not always appreciate the particular shade of compassion offered to us, it's always nice to recognize when someone is simply trying to help us feel better. "What are you giving up for Lent?" That's a common question in these forty days before Easter. And when I ask, nine times out of ten, the answer is chocolate, beer, or social media. But what if we look at Lent as an opportunity not to just temporarily give up a bad habit but to start a good habit - a habit that makes a difference to people, to the world, to God. This year for Lent, my goal is to protect our planet. I'm looking for ways to lessen my impact on our mother earth and bring me joy at the same time. Here is the story of my progress. As long as there are flowers, I have hope for the world. Let me be perfectly honest. I have no idea how to save our planet from the many threats we have imposed to its health and well-being. Thank goodness, there are minds far greater than mine at work on the problem. .
consumers strive to make better choices. Yet for all the intellectual muscle we apply to the challenges of healing our planet, no one knows for sure what will work. On a global level, this is no controlled experiment. We humans are battling air and water pollution, deforestation, climate change and other related problems all at the same time. We are making progress, for sure, but we don't always get things right the first time and we are bound to deal with mistakes and setbacks from time to time. I'm especially aware of the potential for missteps in the business world. As any visit to a Whole Foods Market will prove, many first-world consumers are eager to open our wallets to pay for a healthier, cleaner lifestyle. Maybe we feel a little guilty about the mess we've made; maybe we hope to use our hard-earned dollars to make a difference. But our willingness to pay a premium for environmentally responsible products makes us vulnerable to ill-conceived innovation. Here's a case in point: in response to our throwaway society's need to reexamine packaging options and develop more multi-use containers, a company named Loop is posing a solution. Based on the milkman model, these innovators are developing a home delivery service where products are dropped off in reusable stainless steel and glass containers. When the containers are empty, Loop sends a truck around to pick them up and cart them off to a facility where they are cleaned, refilled, and delivered again. For eight years, I used a similar system called Baby Diaper Service for my daughters' nappy needs. The delivery service was brilliant and worked like a charm. Every Tuesday morning, I set out on my doorstep a bag of used diapers, and by noon, it had been replaced with a sweet stack of freshies Those full bags of dirty diapers were a little rough, but oh, the joy of opening a fresh bag of forty immaculately white, soft as a baby's bottom cloth diapers. Pure magic. Will Loop lead the way into a new philosophy of earth-friendly retailing and change the way we think about packaging? Maybe. I sure hope so. Or will Loop run my wallet dry and quickly fizzle out as an overpriced and inefficient way to bring home the Haagen-Dazs? That's possible too. Only time will tell. Loop is launching in select cities around the world in spring of 2019, and only when a substantial group of consumers use the service will we be able to judge its feasibility. I want to be an early Loop adopter. I've signed their wait list and I can't wait till they kick off in Seattle. Until new data or my bank balance tells me differently, I'm willing to support the innovative dreams of forward-thinking retailers and give Loop a try. family treasures, and drove it 2500 miles back across the country. These are our adventures along the way. I hope this news won't shock you but the truth is that our Streicher family road trips are not always fun and games. There are moments of tedium, boredom, and restless routine. So it's only fair to recognize those moments and to share a few stories about how we combat the realities of the road. A few days into a road trip I always crave veggies. This helps. ^ For the most part, we picnic out of the cooler for our midday meals. But somewhere around the onset of Mountain Time Zone, the cheese is sitting in water and the peaches are all squished, and it's time for a change of plan. Sub sandwiches, either from a local shop or a Subway franchise, are a sure sign that we are desperate for a fresh menu. You think I'm going to use the restroom here? Uh no. Keep driving. ^ Bathroom stops are easy when our route takes us along major interstates. Even in relatively unpopulated stretches of the wide open western states, we can always find freshly built and sparkling clean restrooms at either a gas station or a Starbucks. But when we are traveling on the back roads, the issue becomes far more precarious. Through experience, we've learned to carry a variety of tissue products, hand wipes, and antibacterial gel to get us through the worst of the worst. But even so, as the trip goes on, my patience with gnarly facilities grows thin. On this trip, my husband tracked the time, location and beverage order at each of his Starbucks stops, and sent a photo of each drink to his sister back in Ohio. ^ And speaking of Starbucks, this is an issue of vital importance for my husband. I don't drink coffee but he runs on it. Every morning before dawn he rises to plot our route for the day, including the all-important Starbucks stops. As we pass through the middle of the country, the Starbucks stores thin out considerably, and he compensates for this by increasing the number of shots in his drinks. On the really rough days, he orders a quad venti to see him through. That amounts to a serious dose of caffeine, but whatever it takes to get us home, I'm for. I thought about taking a photo of the truck while it was still full of stuff, but honestly, I was in no mood for photography. I just wanted to get everything unpacked as soon as we possibly could. ^ Eventually, every road trip ends in our driveway where we must eventually face the onerous task of unpacking the car. Or in the case of this trip, the rental truck. Along with our usual suitcases and backpacks, cooler and picnic basket, this time we also carried a full load of furniture and family memorabilia. We broke quite a sweat getting all that cargo unloaded but when the last furniture pad was folded and stowed, we knew that we had made it home. Another real-life road trip was in the books. And as I walked into the house to start the mountain of laundry, I was already looking forward to my next adventure on the road. London came calling in my mailbox yesterday. My dear friend, Heidi, went to London and sent me this postcard. Well. I would like to be in London too. But the second best thing to being there myself is to know that my friend and her mom are enjoying a trip of a lifetime, and in the midst of that joy, she thought of me and took the time to send me a postcard. We are postcard buddies like that. Whenever I travel, I always send Heidi a card, too. Someday, hopefully, I will find myself in that beautiful world-class city. And I'll be sure to send London calling to Heidi too. I own a set of eight straws but as always, some are currently in use. By now, you've probably heard the word on plastic drinking straws - they are outta here. One-use plastic utensils are clogging our oceans and cluttering up our beaches, and we can surely do better. On July 1, 2018, my home city of Seattle was the first major U.S. city to enforce a full ban on plastic straws. Around these parts, stainless steel straws became an emblem of educated consumerism, and many of us began to carry slim drawstring pouches with our drinking tools inside. But Seattle is not the only place where plastic products have been banned. All around our country and our world, the dominoes of single-use plastics are falling at a fast and furious rate. Plastic micro-beads in personal care products. All have been prohibited at some place around the world and more bans are surely coming soon. Not only do these bans help protect our planet from plastic pollution, but they are forcing us to come up with alternatives that are actually far better products. Have you ever sipped an icy cold drink through a stainless steel straw? Steel conducts cold far better than plastic, so every inch of the straw is chilled. On warm days, condensation forms on the outside of the straw, which exponentially increases the icy cool sensation. The overall effect is pure heaven. So if you have not already jumped on the stainless steel straw bandwagon, do yourself and the planet a favor and make the leap. Here's the set that I bought and I recommend them one hundred percent. As we rolled ever west, we followed U.S. Highway 20 across the border into Wyoming. Through Guernsey where we spent the night. Through Casper where we picked up Highway 220. And thus we met up with the iconic Oregon Trail and followed that route up into the mountains to the Continental Divide. The trail as it once was - a rut of worn soil and rock, ranging in width from a passage as narrow as a wagon to almost a mile wide - weaves back and forth across today's two-lane highway as both work their way toward the defining barrier between east and west, South Pass. For the modern traveler, finding the route is as easy as reading the signs along the way, or clicking around on our phones. In desperate times, we can always rely on an old-school paper map. This big ol' mound of granite lies smack dab along the Oregon Trail, just off the Sweetwater River, and serves a welcome sight for you and the travelers of that day. Those who reach the rock by Independence Day - July 4 - consider themselves on pace with the journey, and as you roll in to its shadow, you take this as a harbinger that you will be out of the mountains before the first snows fall in autumn. ^ Today, Independence Rock is just as easy to find and explore. Broad walkways lead in from the parking lot, and warning signs for rattlesnakes remind me of just how accustomed we are to having dangers mapped out ahead of us. ^ The walkways continue around the base of the granite behemoth, and we followed them, appreciating its considerable girth and height. ^ An unintended shot captures my outfit of the day, sandals of the summer, and the pink pom-poms on my favorite summer purse. I love a happy accident. ^ It's easy to appreciate how the emigrants were tempted to scale the mighty monolith. I watched a dad with three young boys test their mettle against the rock and was delighted to see how they scrambled up like a herd of nimble goats. ^ In some places, visitors today are allowed to climb but fences protect areas of the rock where old signatures still remain. Fences or not, my husband does not look particularly interested in a vertical adventure, and so we move along. Following the Sweetwater upstream, your eyes strain for the second key landmark along the Oregon Trail. Just five miles up ahead, Devil's Gate is a natural rock formation, a gorge along the Sweetwater where the currents have worn a distinctive slot in the surrounding granite ridge. Although the trail does not pass directly through Devil's Gate - which would have been a wet, wild ride - you take confidence that you are still on course to South Pass. ^ We made several stops along the quiet highway to find just the right angle for capturing the steep sides of Devil's Gate. The countryside was quiet and lush, the gap was an arresting sight in the wilderness, and other than the fence in the foreground, this scene must look just as it did when the emigrants spied it almost two hundred years ago. ^ As I framed my photos of Devil's gate by looking to the right, I then glanced toward my left and saw this marker: Oregon California Trails. This dry, desiccated patch of ground lay under the wagon wheels and weary feet of the 19th century travelers. I imagined their joy as they realize their climb to the rooftop of the continent is almost done, and I hopped in the car to follow on. 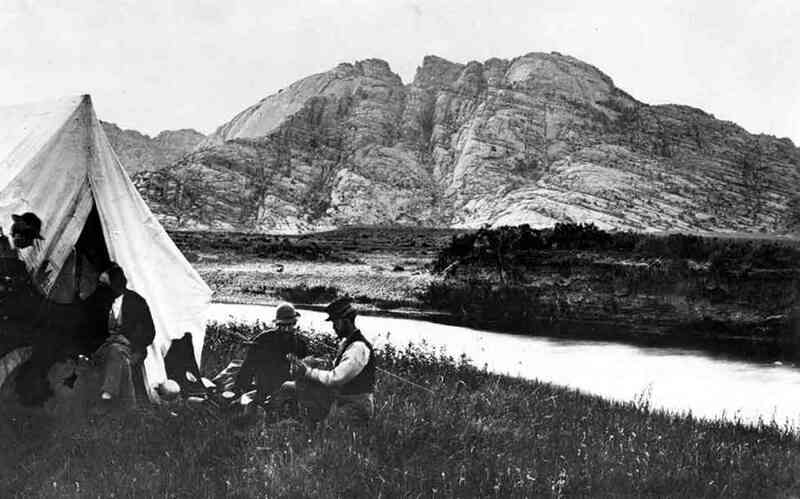 ^ I didn't get a chance to capture Split Rock, but here's a shot of pioneer photographer Henry William Jackson camping on the banks of the Sweetwater at the base of the mountain with members of a survey team in 1870. You've been preparing for this summit, the most extraordinary mountain crossing you will make on the Trail, since the day you set off. The three landmarks have shown you the way, and now you follow surprisingly gentle green meadows up toward the sky. Sure, the hike is strenuous but compared to the snow-covered rocky peaks around you, this scenery is absolutely tame. ^ I've traveled through South Pass quite a few times and yet, every time I'm struck again at the incredible cleverness of the scouts who found this pastoral route. It reminds me of the scene at the beginning of The Sound Of Music where Fraulein Maria is twirling in a flower-strewn meadow in the mountains. This looks like a place for a picnic, not a rigorous mountain crossing. ^ But this is it. The continental divide that the emigrants found by following the landmarks across the miles. I thought of them as I stopped here for a picnic, and hope that they enjoyed their time here too. I hope they felt a special joy and a huge relief as they met this major milestone on their journey across the continent. So I raise my salami and cheese sandwich to you, Oregon Trail travelers, and celebrate your amazing accomplishments. It's a simple fact of life that my father brought very few rays of sunshine into my life, but I will give him credit for introducing me to the joys of hockey. When I was a toddler, he built a skating rink in our Michigan backyard, strapped me into some double bladed baby skates (actually, I expect my mom was the one who dressed me), and set me to pushing a chair around the ice. That's how I learned how to skate. And when I grew big enough, he laced me into a pair of child-sized hockey skates (again, my mom).led me down the hill to a shoveled patch of ice on the frozen lake, and put a hockey stick in my hand. I was the only little girl in the neighborhood who wore hockey skates and that was a little weird but I secretly enjoyed it. By the time I was eleven, my hockey skates had been replaced with figure skates and my dad was gone, but Hockey Night in Canada has remained. Here in Seattle, we don't have a National Hockey League franchise. Never have, but soon we will. The new team will begin to play in the 2021/2022 season and I'm excited for that new day to come. But in the meantime, in order to catch an NHL game, I need to travel to an NHL city. And the closest one to my house, clocking in at 125 miles, is Vancouver, British Columbia. Recently, my first-born, who is an avid fan of the Colorado Avalanche, and I made that trip up to our northern neighbor to catch a game when the Avs were in town. Yes. We went to see hockey. At night. In Canada. Although it's entirely possible to go up for a game and back in a single day, my daughter and I decided to treat ourselves to an overnight stay in Vancouver. 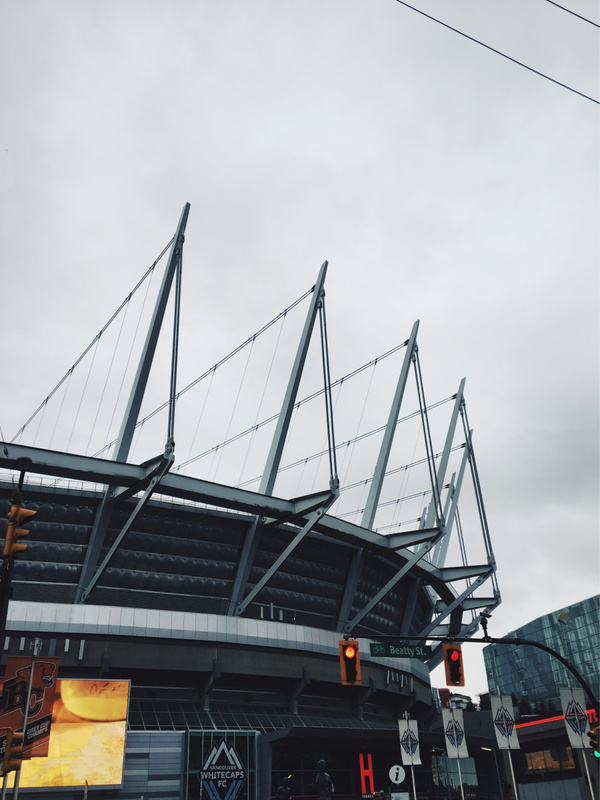 She booked us into a hotel half a block from Rogers Arena, and Yelped us a meal plan that was full of delicious surprises. So when we pulled into town around mid-afternoon, we checked into the hotel, and then turned right back around to find us some food. ^Meat & Bread had all the accouterments of a proper postmodern eatery: salvaged wood, subway tiles, minimalistic wall art, and a tightly edited menu. We were hoping to try the highly recommended porchetta sandwiches but they were already sold out for the day. So we settled for the meatball subs instead. ^ They were, in a word, delicious. Packed with plenty of greens and accompanied by a puddle of spicy mustard, the sandwich was powered by punchy flavors. Both my daughter and I struggled to maintain our composure while eating - chunks of meat dropped onto the table, the bread crumbled, and of course that mustard dribbled all over our hands. We each used a dozen napkins and pronounced the masterpiece a deliciously messy plate of good food. As we were eating, two other customers came into the restaurant, each a party of one, sat at tables to our immediate right and left, and began to eat their own meatball sandwiches. To my daughter's and my astonishment and surprise, each of them munched down every delicious bite without spilling so much as a crumb, and when they had finished, used exactly one napkin apiece to gently dab at the corners of their unsoiled mouths. We never did figure out how they managed to eat so neatly, but we were mightily impressed. ^ For dinner, we tried a pizza place called The Parlour. Rustic handmade personal size pizzas and icy Cokes were the perfect post-hockey refreshment, and the restaurant's dark and memento-filled ambiance was cozy and warm. ^ And the next morning, on our way out of town, we grabbed breakfast at Café Medina. I'm not much of a breakfast food person, but word on the street was that they served the best waffles in town, so I decided to give the waffles a try. Light and airy, drenched in proper Canadian maple syrup. They did not disappoint even a waffle cynic like me. But now let's get to the meat of our visit. Vancouver Canucks versus the Colorado Avalanche. A fun game, with an overtime win for the Canucks that left us Avs fans deflated but the hometown crowd buoyant, which made for good vibes as the crowds spilled out into the streets after the game. But win or lose, my favorite moment in the game came early. ^ We planned to arrive early. Before dark, we left our hotel, joined the throngs of people already flowing into the arena, and found our seats. ^ Thus properly oriented, we made our way down to the ice and stood at the glass to watch the Avs warm up. Around and around the players moved through their pre-game drills, taking shots on goal, then forming up lines behind the net and passing in front of us as they made their way back up to center ice, their faces just a few feet away from ours. As we watched, I became aware of a twelve-ish-year-old-boy standing next to us along the glass. Well. Everyone within a hundred feet of us was aware of this kid because he had the kind of loud, overbearing manner that is the particular specialty of boys that age. As each member of the Avs passed by us in formation, this little darling would pound on the glass with his open hands and shout at the top of his lungs in hopes, I suppose, of getting a player to react. But the players did not react. Professionals that they are, the Avs continued to loop around, focused on their warm-ups and the game ahead. They paid no attention to my obnoxious young neighbor. ^ Skating slowly around the corner, in line with his teammates came Nial Yakupov. Number 64. He had already passed by the little attention-seeker any number of times during the course of the warm-ups. he suddenly broke formation, veered over to the glass where this young fan was pounding and yelling. In a split second, Yakupov formed a fist and punched the glass as hard as he could right in front of the boy's face. As only an overgrown boy himself would do. And in the next split second, as the boy stared in stunned silence, Yakupov grinned an enormous smile at him and skated off to re-take his place in line. The boy turned and ran off to find his parents. I can only assume he wanted to tell them what had just happened. I certainly hope so. I'll be telling this story for the rest of my life, and I hope the boy will too. Maybe someday he will grow up, become a hockey player, and punch the glass in front of some other crazy little boy's face. There's just no telling what might happen on a Hockey Night in Canada. Credit for photos 4, 9, 10, and 11 to my first-born, whose photos bring my story to life. Thank you!